Out of the pages of 4001 A.D., the breakout hero of the 41st century charges onward in an high-powered tale of tomorrow from New York Times best-selling writer Fred Van Lente (ARCHER & ARMSTRONG) and high-octane artists Stephen Segovia (NINJAK, Action Comics) and Tomás Giorello (X-O MANOWAR)! Two millennia from today, Earth is not the hospitable home we once knew. Ravaged by an endless onslaught of war, disaster, and time, the world is littered with desolate badlands, fortified kingdoms, and secretive enclaves where humanity still clings to life... Enclaves like The Grove - Earth's last known repository of scientific knowledge and bioengineered prosperity. Now, under the leadership of the lone protector called WAR MOTHER and her sentient sniper rifle, the denizens of The Grove face a critical choice: remain where they are and die, or find a new land and flourish. Can War Mother lead her people out of isolation and reignite the fires of a dying planet? And even if she can locate the distant citadel she seeks, can she fight back the horrors and perverse monstrosities that lurk just beyond her doorstep? In the footsteps of RAI and BOOK OF DEATH, raw power meets tribal warfare as Fred Van Lente & Stephen Segovia forge a modern myth of the near future through the fire-tempered frontier of 41st century Earth for Valiant's next stunning science-fiction showdown! 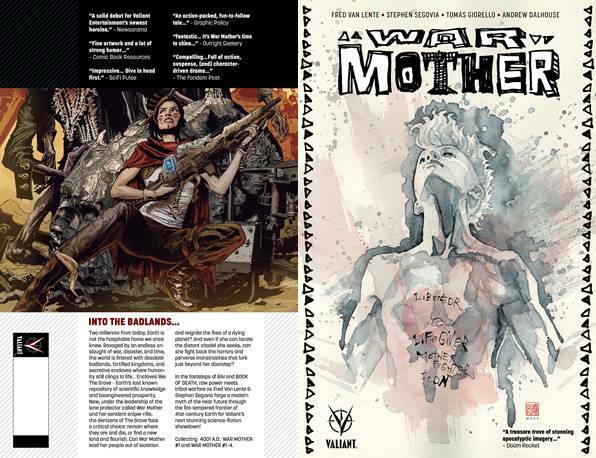 Collecting WAR MOTHER #1 - 4 and 4001 A.D.: WAR MOTHER #1.